The latest Annual Report from the Royal Mint shows that production of 1 and 2 pence coins was roughly halved in 2016-17 compared to the previous year. Production of pennies fell from around 500 million, to just 288 million. 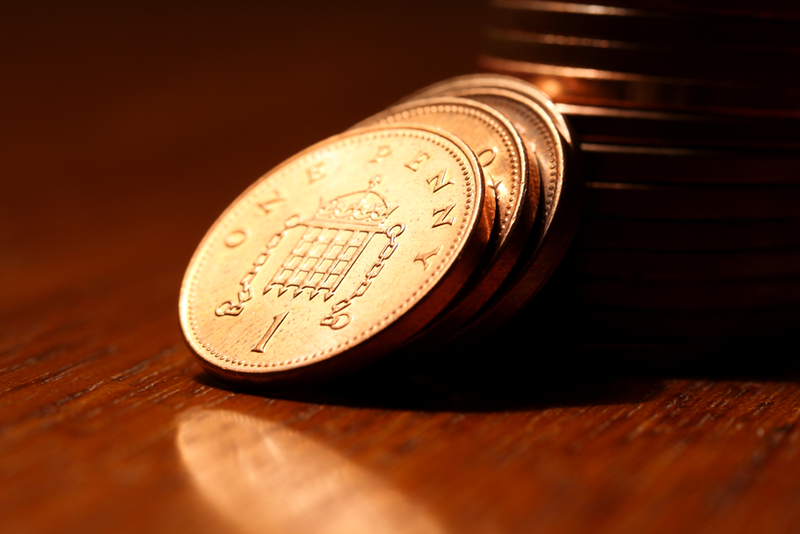 Earlier this year, the Spring Statement and a call for evidence on cash and digital payments from HMT reignited a discussion about the retirement of low denomination coins, specifically the 1 and 2 pence pieces. The HMT consultation document highlights that six out of every ten 1p and 2p coins are used just once before they drop out of circulation – into jars, down the back of the sofa or just lost to the ether. What is more, as inflation slowly erodes the purchasing power of the penny, the balance between its usefulness and its cost begins to shift. It has been argued by some that removing the 1 and 2 pence coins could be inflationary. The argument goes that as retailers have tended to price items just below round numbers they would end up rounding their prices up more frequently than they rounded them down (to the nearest 5p – the next lowest denominated coin that could be given in change). However, such arguments are flawed on a number of levels. First, in practice, economies that have removed their low denomination coins, or introduced rounding (and there are lots of them) have moved to a system in which rounding is applied to the final bill, not to individual items. In such a system, the prices of each item need not be affected at all. More than this though, if you buy more than one item at a time, the bias in the probability that your total bill will need to be rounded up rather than down falls. Research shows that just 3 items may be enough to remove any inflationary bias in rounding, even if the underlying items have a bias towards ending in .99. Second, in most existing cases, rounding is only applied to cash payments – payments by card or similar electronic means would likely still be charged the exact amount. For most advanced economies cash payments tend to make up a low proportion of spending by value. In the UK, for instance just 3% are made using cash. What is more, low value payments, where cash has always been king, have been encroached on in recent years by the adoption of new technologies such as contactless cards. Finally, the prevalence of item prices ending in .99 has fallen in recent years, by approximately 1.5 percentage points since the beginning of 2012 and 2 percentage points since its peak in mid-2015 (chart below). It now only accounts for just over 12% of prices. This is mirrored by an increasing tendency for prices to end in round numbers and suggests that, over the past few years, there has been a declining proportion of items whose prices are likely to be rounded up if the 1p and 2p coins were abolished. What if, for some reason, retailers ignored guidance or laws to only round final bills, and rounded the price of every single item? 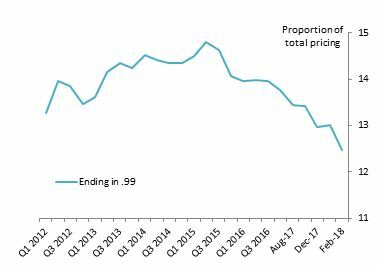 Using data from the ONS we can see that, for February 2018, roughly 70% of prices in the UK already end in a zero or 5, and so wouldn’t need rounding at all. Of the remaining 30%, 25 percentage points end in a 3, 4, 8 or 9 (and so would conceivably be rounded up) and 5 percentage points end in 1, 2, 6 or 7 (candidates to round down). To gauge the impact of rounding at the individual item level we run three scenarios. In the first, retailers round their prices to the nearest 5p. The second assumes that retailers round all their prices down to the nearest 5p, and in the last, retailers round all prices up to the nearest 5p. The results (Table A) suggest a range of 0.07pp to -0.15pp. (1) Prices in red are most likely to be rounded up, prices in blue are most likely to be rounded down, and prices in green will remain as they are. Even these small numbers are probably upper bounds on the true impact because of the limiting practical factors discussed above relating to final bill rounding and the use of cash. Finally, it should be noted that, even if a significant impact on prices were to be observed, it would be a one-off price level shock, rather than a sustained change to the rate of inflation. International evidence finds little support of inflationary effects caused by removing low denomination coins and implementing rounding. Wharples, 2007 uses transactional data from the US and finds removing the 1 and 2 cent coins would have a negligible impact on inflation, with the average impact being negative but not statistically different from zero. What is more, he shows that any inflationary impact would be dominated by the benefits to payments efficiency. Chande and Fisher,2003 use similar data for Canada and find no significant consequence for inflation, especially for purchases with multiple items. Similar studies can be found for Germany, Hungary, Belgium, Finland and the Netherlands, and others that show that removing low denomination coins would have little to no impact on the general price level. Keinsley, 2013 builds a theoretical model which confirms the lack of significant inflationary effect, even for shocks that are substantially larger than implied by other empirical works. As inflation steadily erodes the purchasing power of low denomination coinage, the case for its removal becomes stronger. This is not a new phenomenon and has been seen time and again, the world over. Even in the UK there is a precedent with the abolition of the halfpenny in 1984. Many of the arguments that were made in the early 1980s around the inflationary impact of removing that particular tiny coin are being made now. However, the evidence, including our own work on UK price data suggests they are unfounded. Marilena Angeli works in the Bank’s Structural Economic Division and Jack Meaning works in the Bank’s Monetary and Financial Conditions Division. Next Post Fog in the Channel? How have equity markets reacted to Brexit news? From your analysis it seems a sensible decision to scrap both the 1p and 2p coins. But beyond your conclusion of the negligible impact this would have on inflation, two tangential questions: (i) what are the cost savings of no longer minting these coins? Doubtless, the savings are relatively small but the current position of ‘spending money’ to produce coins that are of limited use doesn’t make a lot of sensible; (ii) what would the impact be on charities? Many people put low denomination coins – plus higher denomination coins or notes – in charity boxes. Could charities see an increase in giving from the ’rounding up’ of gifts? I would certainly support ditching the 1p and 2p coins, as I have a shrapnel collection on my mantlepiece that is unlikely to see the inside of my pocket again! When they were introduced in 1971 you could post a first-class letter for 3p, instead of todays’ 67p. They’re now just an annoying waste of metal. Can I suggest that the 1p and 2p coins go but a new coin is introduced say the 4p, this would mean that even paying cash the exact amounts could still be made up even if the maths of giving change becomes more complex!. 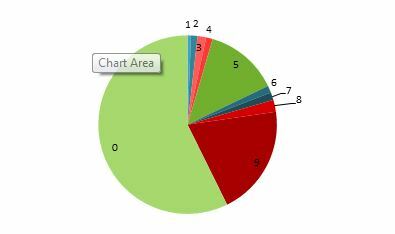 Or alternatively if the lowest is a 5p introduce a 6p! I lived in Australia at the time of the de-circulation of the 1c and 2c coins, and many of the same arguments were made at the time. However, when it really hit was at the introduction of the GST, as it meant that there was less flexibility in price escalation to the 5c/10c barrier. So any increase in high street taxes – ranging from VAT to alcohol, tobacco, or sugar – mean that there may be a disproportionate price surge/ripple effect. While electronic banking has become more prevalent since the Aussie discontinuation in the 1990s, the potential overhead increase for small business retailers is still there, and honestly sometimes it’s more convenient to pay cash – even if it means a pocketful of coppers. The argument now on the cost of production and the usefulness of 1p and 2p coins is at a state where circulation is close to the production costs of them. Since the BoE enjos seigniorage then savings are very minimal though still positive. Largely, it’s a minor point in the overall conversation. The ripple effect as Charles mentions is an interesting one – where VAT, tax policies impact and result in less flexibility for consumers with a larger increase on retailers. The continued shift in payment methods means I still think 1p and 2p will continue to decline in use, forming a smaller % of cash payments vs the increase in contactless and card payments that pay the exact amount. A gradual transition would ease the consensus on the need for 1p and 2p as prices (though rounded up), will spark a change in consumer cash behaviour and the need for it to be in circulation. Would you be able to cite and link to the source of your data used for the graph of “Distribution of prices to the nearest whole penny”? As the old saying goes….every penny counts…..be it in virtual reality on a computer, or as physical pennies…!! If small coins make so little difference, how is it that a 5p charge for carrier bags has had such a large effect on consumer behaviour? You underestimate the psychological effects. If the smallest coin is 5p, then in due course the smallest incremental price increases subsequently will be made in multiples of 5p. That is what happened after decimalisation, when prices started to increase in jumps of 2.4d instead of 1d.